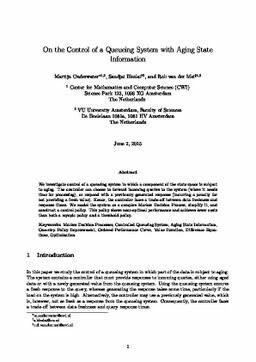 We investigate control of a queueing system in which a component of the state space is subject to aging. The controller can choose to forward incoming queries to the system (where it needs time for processing), or respond with a previously generated response (incurring a penalty for not providing a fresh value). Hence, the controller faces a tradeoff between data freshness and response times. We model the system as a complex Markov decision process, simplify it, and construct a control policy. This policy shows near-optimal performance and achieves lower costs than both a myopic policy and a threshold policy.